In true classic style, A Heartless Design delivers the romance-lovers favorites: an evocative love story in an historic setting. Characters are wonderful. Cordelia is utterly believable as a woman of her times, with a little gift (for engineering) that sets her apart. It doesn’t do to be set apart at such times; women were meant to keep to their place. Her skill and her age means she is an unlikely heroine for a romance. She has also (*gasp*) chosen not to marry, leaving her quite out of the marriage market. However, she captures our sympathy at once, as her kindness is evident from the first. A wonderful main character, with secrets, but everything is also and obviously delivered in a beautiful and flowing writing style. The backdrop is London, of course. All the expected items are in place: Balls, family, and the grande style of homes with the obligatory loyal servants, but it is all so nicely presented as to seem interesting. The gentleman in the picture, Lord Thorne, is offered as almost a prize. However, one does have to wonder how he has managed to elude marriage for so long…His friend and fellow officer, Neville is also important. In fact, the reader is inclined to develop quite a crush on the amusing Neville, aka ‘Aries.’ The author exhibits a particularly deft touch in developing the friendship of these men and only gradually do we discover what sort of ‘business’ their affiliation in the ‘Zodiac’ actually represents. A Heartless Design has more depth than one might be given to expect in a romance. In fact, there is a threat both men suspect… though neither they nor Cornelia know of her own place in this intrigue. How could they know? She must, given the cultural norms of the time, keep her own involvement completely secret. Her secrecy might well end up endangering her, but trust is a hard master as well. There’s chemistry between she and Thorne, of that there is no doubt! Yet, true trust is a completely different thing. This delightful romance, with its element of mystery/espionage and potential danger, is completely enthralling. Step back into a perfectly satisfying early nineteenth century romance – and find what one could hardly expect: the unexpected. 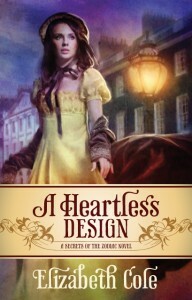 I recommend you put A Heartless Design right at the top of your reading list!